Bird mites are small parasites that need to feed on blood from living organisms to survive. Bird mites are known to seek out and feed on humans when their bird hosts are not present. When the young birds leave a nest the bird mite will enter a home seeking a blood meal. The bird mites are attracted to humans by receptors that detect moisture, heat and CO2. In many cases bird mites can be very aggressive and can quickly multiply into the thousands. Once a home is heavily infested with bird mites it can become overwhelming and difficult problem to eradicate. Bird mites will typically infest bedding, carpeting, upholstered furniture, clothing, etc. Like Bed Bugs the bird mite will hide in dark areas, cracks, crevices, folds and seams of fabrics and upholstery when they are not active. Bird mites are most active at night and on damp, humid, overcast days and less active on hot, dry, sunny days. VIDEO: 3:04 Bird Mite Obsession | Infested! Unlike scabies, bird mites are not known to burrow into the skin of humans, but in some cases can cling on to human skin for a period of time. Bird mites in many cases have become resistant to standard chemical pesticides. Bird mites unlike other types of mites that may stay localized, will often disperse throughout your home seeking hiding spots as mentioned above. Like “bed bugs” bird mites will come out of these hiding places at night to feed on blood. In your quest to find were the bird mites are hiding and breeding in your home “no stone should be left unturned”. To successfully eradicate a bird mite infestation you must find all their hiding spots and spray those infested areas repeatedly for several days until you no longer see any signs of mites. With so many mite sprays on the market it is difficult to determine which mite killer spray will work best for you. In our opinion it is always better to use a good natural enzyme based bug killer that is safe and non toxic. Natural enzyme based bug killers for many, has been extremely effective in eradicating bird mites, as the enzymes cause the mites to molt or shed their exoskeleton prematurely. Enzyme based bug killers are widely accepted in the field of pest control, as enzymes leave no toxic residues and the enzymatic effect on the insect exoskeleton, is fast and completely safe. 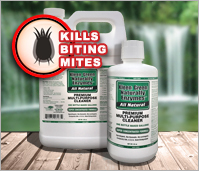 Below you will find links to our recommended online retailers that sell natural enzyme based bug killers. Onlinebedstores.com will only recommend authorized retailers of the products they offer. Our recommended retailers are also always available by phone to answer your questions and to provide expert advice. Eradicate Mites Safely and Effectively. Fast Free Shipping and Expert Advice by Phone.